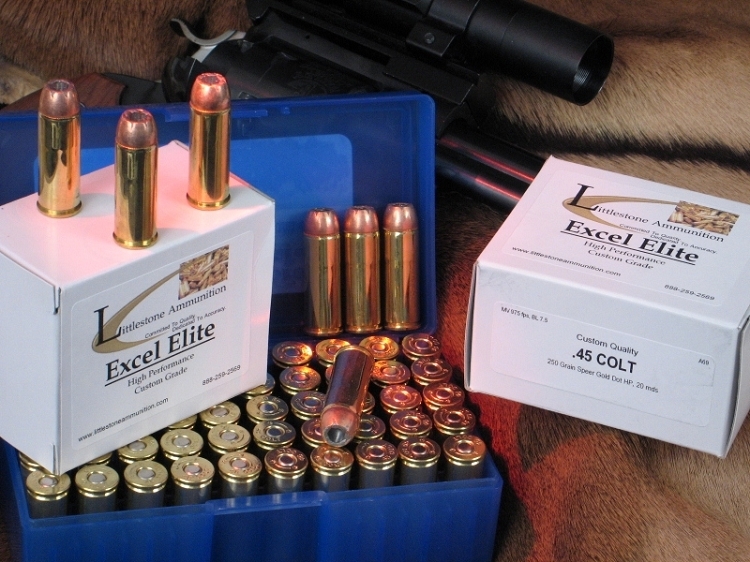 Twenty- and 50-round boxes of Littlestone Ammunition's loading of the .45 Colt cartridge with 240-grain Sierra Jacketed Hollow Cavity bullets. Hover cursor or click on photo for close-up view. Firearm not included. Load the power of Littlestone Ammunition for self-reliant confidence in your .45 Colt revolver. These 20 rounds of custom-quality Littlestone Ammunition launch a 240-grain Sierra Jacketed Hollow Cavity bullet at a muzzle velocity of 980 fps and it packs 512 ft lbs of energy. After you test one or more sample packs, if you and your gun like the load, come back and purchase it in greater quantities. Of course, if you prefer, use the "Add To Cart" button above to purchase this 20 rounds of Littlestone Ammunition now. Feature 3: MV / Energy / Barrel: 980 fps / 512 ft lbs / 7.5"